There is a genius to the way that Pixar crafts their stories. They made their name from building worlds around unique ideas full of potential (see Toy Story or Monsters Inc.) but The Incredibles shows that they can also take an idea which has been done to death and manage to make that just as unique. The Incredibles is a superhero movie but at the same time, and arguably more so, it is a family movie. 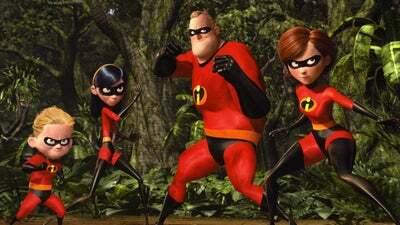 The Incredibles manages to balance the action of a superhero movie with the ideas of family unity, being yourself and working together. All of this and it is brilliantly funny as well. The first strength of the movie is the superhero aspect. Being animated, Pixar have only the limits of their imagination and their creativity to hold them back. This means that we get superheroes of all types and abilities. From Mr Incredible’s super-strength, Elastigirl’s flexibility through to Frozone’s very cinematic ice-powers; the superheroes are brought to life in full colour and exciting ways. Some of the superheroes we only get glimpses of showcase a world which has been fleshed out and created, even if it isn’t properly explored in full here. Of course heroes are only as good as their villains. The best superheroes have the greatest villains and The Incredibles are no different. Again, there is plenty hinted at but the Pixar magic shows through with clever villains such as Bomb-Voyage. The main villain is also more than a match for the heroes and has a drive and motive that makes some sort of sense, particularly considering this is a “kids” film. To match the superhero action though is the family aspect. The Incredibles is set in a world where superheroes have been outlawed (for reasons that don’t seem too far-fetched in the claim-culture we live in presently) so many have now settled down with families. This is where the movie comes into it’s own. Even with super-powered children that can turn invisible, have super-speed or can create force-fields, the dynamic is a classic family one that anyone will recognise. Some of the best and funniest moments come from arguments around the dinner table or heated discussions about “glorified graduations” that have nothing to do with superheroes but all to do with the everyday American family. The film comes into it’s own when the two world’s collide though. This is where the film finds it’s best humour, like bickering in a car about directions during a high-speed rescue or it’s best action, especially when all the family are let loose together. Director Brad Bird has crafted some great action here, from a high-speed chase through a jungle to a great battle between Mr Incredible and a huge robot. The action never feels too cartoonish and there are always stakes. One moment involving an aeroplane and rockets will have anyone with a family on the edge-of-their-seat as it becomes clear that the kids are also in danger too. Which is where the greatest aspect of The Incredibles comes into play: it is a movie with heart. The best superhero films are not about action set-pieces or showdowns between good and evil but about everyday humans doing incredible things. The Incredibles shows this with moments that really highlight how it would be like to have a family and try to save the world, especially if it means placing the former in danger. This is brought to life perfectly with an able voice-cast. Craig T Nelson is a great Mr Incredible, with comic timing that hits every time. He has two great actors to play-off as well. Helen Hunt is clearly having the time of her life as Elastigirl and her iconic voice gives the Mom a commanding presence. Samuel L Jackson is the best choice though and Frozone just about steals the movie, even if he is no more than glorified support. Overall, The Incredibles shows that Pixar can take a genre that has been ringed dry of content and add something fresh and unique. The Incredibles is funny, action-packed but also full of heart. It will appeal to the superhero fan or anyone who has an average, everyday family. Is there no genre Pixar can’t do?